Effect: Popup menu, Default: Defocus Color . Selects between full color or monochrome defocus. Defocus Color: defocuses all channels of the source input. Defocus Mono: makes the source monochrome and then applies the defocus (faster). Defocus Width: Default: 0.088, Range: 0 or greater. The width of the defocus. 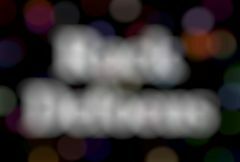 This parameter can be adjusted using the Defocus Width Widget. Show Shape: Check-box, Default: off. Gauss Blur: Default: 0, Range: 0 or greater. Chroma Distort: Default: 0, Range: any. Color Fringing: Default: 0, Range: any. Transparent: Areas outside the source image are treated as transparent, which can produce transparency around the edges of the image. Select this for fastest rendering. Show Defocus Width: Check-box, Default: on. Turns on or off the screen user interface for adjusting the Defocus Width parameter.